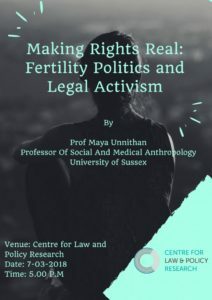 Prof Maya Unnithan will be talking on ‘Making Rights Real: Fertility Politics and Legal Activism’ as a part of the Occasional Talks Series at CLPR. Human rights-based approaches have become prevalent in development policy and discourse on population planning (fertility control) and maternal health in India from the mid-1990s when the UN international human rights system began to use and develop the language of reproductive rights. This period has also seen strong civil society activism to ‘translate’ rights (‘make rights real’) to bridge the gap between the rhetoric of policy and the reality of access to healthcare on the ground. But how do development actors interpret and mobilise universal rights-based ideas in a context with a long history of indigenous rights discourse? And to what effects? Drawing on the diverse ethnographic accounts of sexual reproductive rights activists and health rights groups in Rajasthan as well as legal aid organisations Prof Maya Unnithan will discuss how through their instrumental and normative use of rights-based frameworks, civil society actors reinforce but also challenge neoliberal modes of health governance. More generally she suggests that anthropological work on rights helps elucidate the cultural politics of globalisation. Prof Maya Unnithan is a Professor Of Social And Medical Anthropology (Anthropology, Sussex Centre for Migration Research, International Development). Maya is a Member of Centre for Innovation and Research in Childhood and Youth and Director of the Centre for Cultures of Reproduction, Technologies and Health. Her research expertise and interests include: caste and kinship, childbirth and infertility, gender and development, health and migration, human rights and reproductive health, maternal health inequalities, reproductive technologies, social anthropology.